Time has flown by. Your best girl friend is now getting married. It seems as if just the other day you two were playing truth or dare with a group of boys in high school. Finally the day is here where she has met her dream man that she wants to spend the rest of her life with. You’ve known her most your life and are happy for her taking this next step in her time on earth. Get her something she’ll be impressed with for her big moment that memorializes her commitment and support her decision. 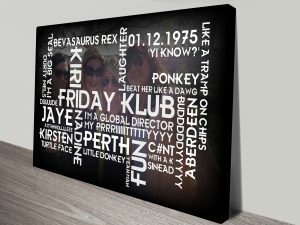 The customized word art offered on this site will be adored by your best friend may even bring a tear to her eye. 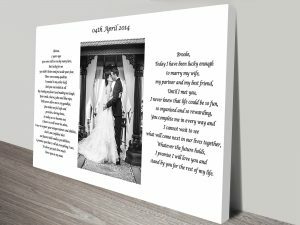 Each word that you decide to put on our 100% cotton canvas should be thought of carefully and bring up good memories or emotions spent between you, her friends and husband. 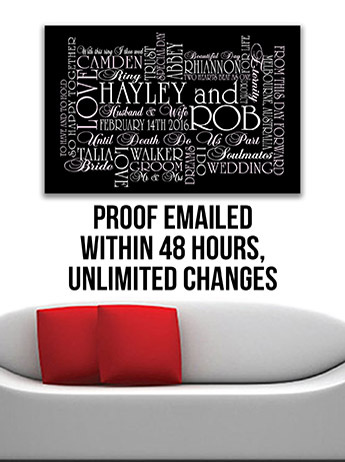 If your having trouble thinking of these, review the gallery or just add wedding related words. 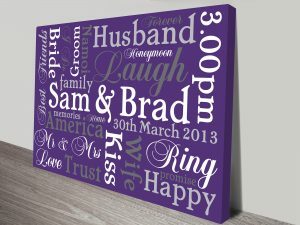 For one idea, start off by getting the bride and grooms name centre with The Classic Inspiration- Purple. The format can include two or three different fonts and colours that will display class and elegance in her living room. Purple was the colour worn by Roman royalty and with this beautiful shade of purple, her home will feel like a palace. Your best friend wants to feel like you support her marriage and a potential life long decision. It’s understandable that you have some trouble accepting the fact she’s moving on and opening a new chapter in her life. 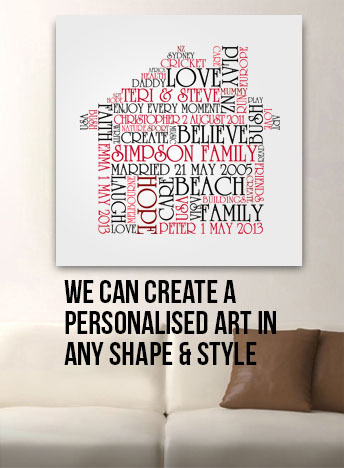 A personalised artwork is a great idea for a wedding gift, not only to show that you fully encourage her actions but to show her that you’ll be there for her and her new other half. We all know that brides can be emotional on their big days. 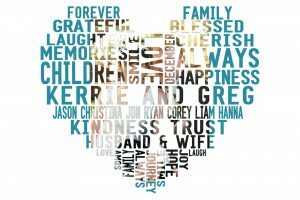 Think of getting the bride and groom The Photo and Words Art to combine on your favorite photos along with catchy phrase or words that are important to their relationship. 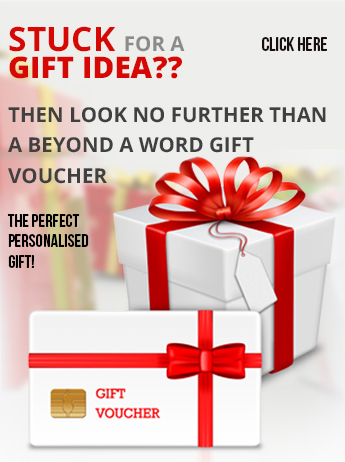 This gift will lift her spirits and put her in a great mood if she was feeling stressed before. She will be glad to have a new piece of artwork that symbolizes her new endeavor for a long lasting, loving relationship. Another great idea for a wedding gift (especially good if you’re a little late) is The Wedding Vows Art 1. Combine a beautiful photo from the wedding of the bride and groom on their special day with vows they promised each other just before they said “I do”. The photo will be in the center, right in between the vows of each spouse. Bring them back some great memories with the photo-styled word art. 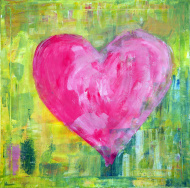 So don’t be a deadbeat bridesmaid and customize your artwork for your best friend right away!